This issue features all quotes from famous composers because of my new mini musical made this month and featured at the bottom of the newsletter. It is funny. You will like it. 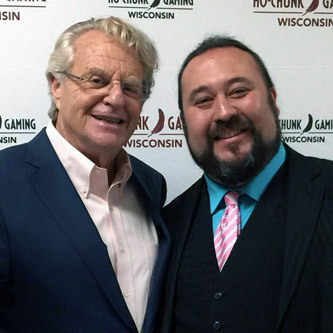 Just a few days ago: Jerry Springer and I after the The Price Is Right Live – Stage Show at the Ho-Chunk Casino in the Wisconsin Dells! It is a great joy to open for this experience! He is quite polite in person, not what his television show would lead you to believe. I have been very lucky in my career to be able to work with and interview a lot of celebrities on TV and in shows like Comic Con and Anime Expo. Earlier this month I performed at a private event and the Band Big Bad Voodoo Daddies, who I have seen in concert, were my opening act! Currently I’m working on a new video to showcase some of my best moments with celebrities. Working with celebrities like this seems to make it easier for clients who have never met me before to value and differentiate my work from local amateurs. It is currently an 8-minute rough cut. It will be cut down to about 3 minutes. But here are some clips you might enjoy with Micky Dolenz, Danny Glover, Robbie Amell, Paris Themmen, Ronda Rousey, Sean Astin, Tim Kang, Cristina Ferreira, Mark Steines and more. Remember that time you lost your job and had to write a resume, get references, schedule lots of interviews, fill out tons of paperwork, and face constant rejection… If you really love that experience, become a freelance artist. You will be doing that 30 hours a week. Except for those few shining and beautiful moments when friends step up and give you references, referrals, and inside info to help you land gigs with their contacts and companies. Lesson: Being an Entrepreneur is hard. Make lots of friends, and be a good friend to them. Friends make all the difference. Please let me know how I can be a better friend to you. I am so very grateful for your friendship. Let me know if I can help facilitate fun at your trade shows, parties, or brighten your meetings this year, lets create days your guests will remember for years to come. LAS VEGAS: Come and see two amazing shows at The Orleans Hotel and Casino – Las Vegas August 26th & 28th that I am producing along with HypnoThoughts Live! Amazing variety acts that you have seen on TV and around the world. Tickets only $30. Two completely different line ups!